In a previous article I explained how we work out the layout of the comics with the help of visual scripting. One part of visual scripting was reference-material. In today’s post the pencil gets to work. Accordingly the finished draft will be called “pencil” as well. For those wondering if there aren’t any sketches or more drafts: Yes sometimes I do those, too. But in this case it is not necessary, because I use a historical reference-pictures as a template in the first panel that will be supplemented with persons and other elements later in the process. So we skip that and get directly to the pencil. Later there will be the inked drawings, the coloring and the placement of the speechbubbles and textboxes: The lettering. I always start my drawings with a blue pen. Back in the days it was the traditional col-erase but in the meantime I switched to the tools by toonbase. 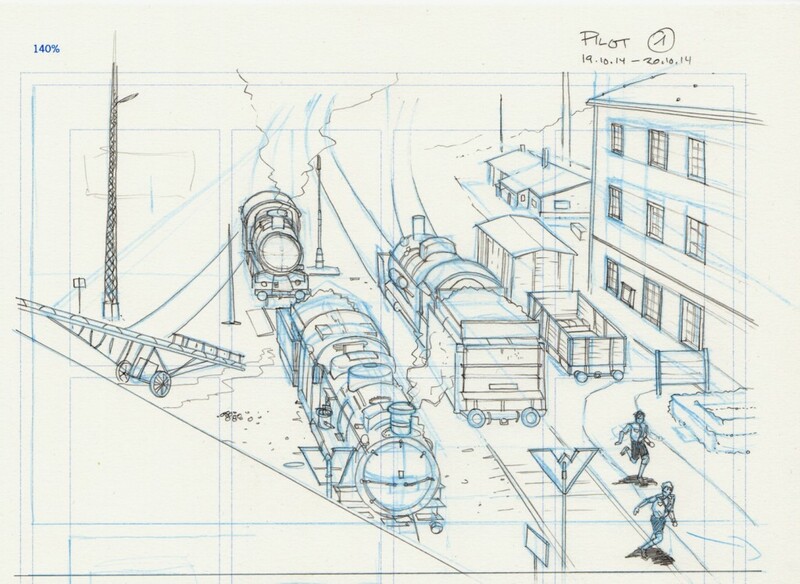 The layout in blue is a traditional way of working of comic-artists who don’t work fully digital. It originates in the pre-computer-era, when artists used the effect that a specified shade of blue wasn’t recognized by repro-cameras in the prepress reproduction. So you you spared yourself from huge erasing-orgies to get rid off all the pencil-strokes. Today the principle is the same with the difference that you just let photoshop do the work of filtering out the blue lines. 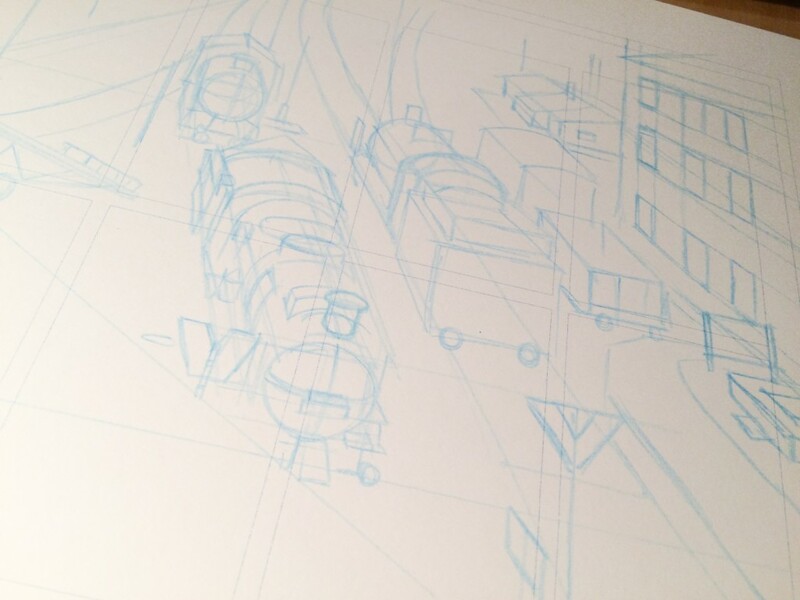 My workflow with complex drawings like the ones for Grossväterland provides even two “blue phases”. The second blue phase will be explained in the next article about inking. As soon as everything fits in here, I get out my pencil. After years and years with “normal” pencils and my beloved Faber Castell Dessin 2001 (unbelievable low priced, unbelievable great strokes) I switched to a mechanical pencil last year. Really convincing was the awesome built-quality of the rotring 900. The advantage not only lies directly in your hand but you can also save the time for pointing the pencil. So my workflow becomes really fluid. A possible disadvantage: The strokes are looking a bit less lively because of the missing grit. But that doesn’t play a big role since I am going to ink later anyway and I’m working more and more in a Ligne Claire-like Style in the tradition of Eduardo Risso. It is even a bit of an advantage because the mechanical pencil is really close to the ink. True fact: In my project ONE. and other works for clients it appeared that I could even use the pencil as a base for the coloring and could leave out the inking completely. What you can see in the picture as well: I print out a grid before I layout the blueprint – a 4 by 4 grid in this case – on the drawing paper in blue as well. The pencil is in any case the most time consuming step of the work because all the important details have to be worked out in it. From time to time some of those detail are just hinted and are made concrete in the ink. But anyway: A good pencil must be able to work on its own. Furthermore we use the pencil – from time to time the blueprint, too – to coordinate our work in the project-team. That is really important because the pencil is the easiest stage to do corrections. Erasers rule, you know? So much about the pencil. Here is the finished result – still without the lettering. That I am going to explain in part IV.